Just a bit of information first which I also did not know. Cocoa Butter comes from cocoa beans (I knew this 🙂 ) which are fermented, roasted and then separated from the hulls. The beans are then ground into a paste to make a chocolate liquor ( doesn’t that sound yummy) which is made of equal portions of cocoa butter and cocoa solids. 1- Cocoa Butter is high in antioxidants which help protect the skin from free radicals or toxins that can damage the skin on a cellular level. This wonderful butter is also high in vitamin E which has the beneficial properties for skin cell renewal. 2- The fact that this wonderful butter is solid at room temperature but will melt readily on your skin makes it a great addition to any lotion or cream. 3- Cocoa Butter not only penetrates the top layer of your skin but also into the second layer of your skin providing a deep penetration of its wonderful goodness. 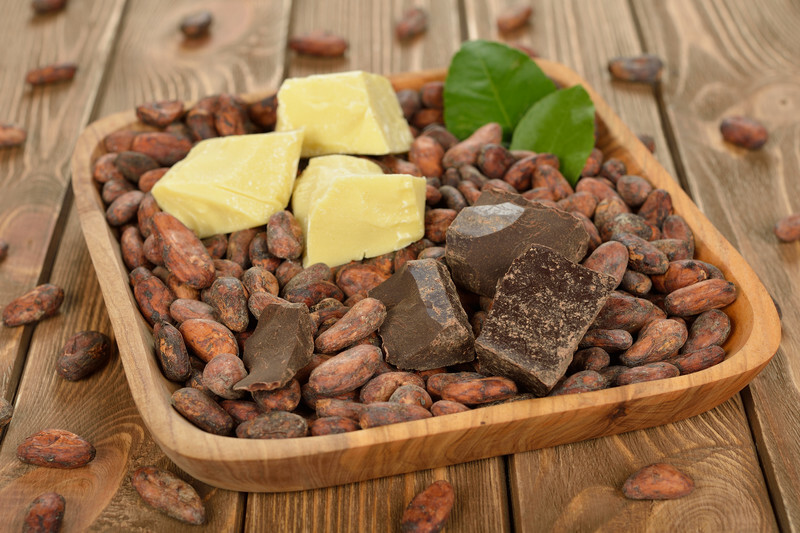 4- Cocoa Butter is an excellent emollient as it is well absorbed and softens and hydrates dry skin. 5- Lastly using unrefined cocoa butter adds a touch of that chocolate undertone to any product and we all know that can be a good thing! Have you used products with Cocoa Butter ?